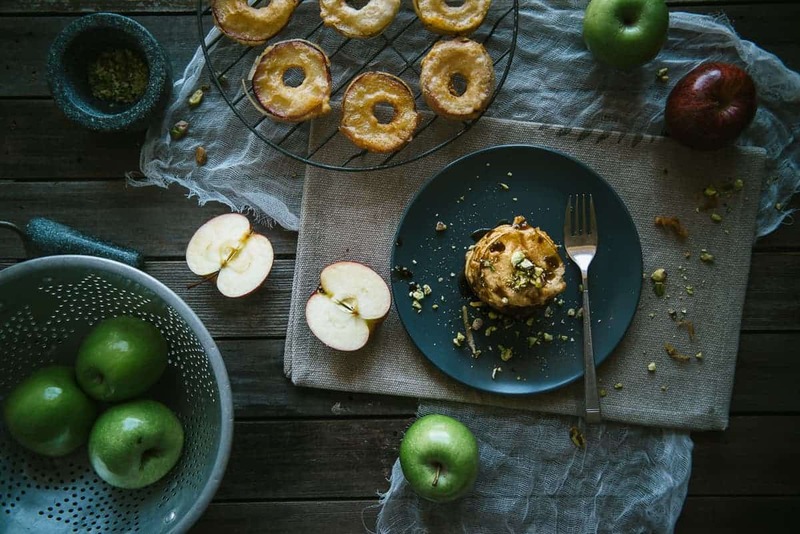 Warm up this winter with these gorgeous apple fritters made with orange blossom water, pistachios and pomegranate molasses. They say an apple a day keeps the doctor away. Not sure if the same thing can be said about my apple fritters recipe! As I have previously mentioned on the blog, deep frying and me do not have a good relationship. If you remember from my sweet potato loukoumades recipe I actually ended up with severe burns due to the oil splashing back on contact with the batter. But I’m still here to tell the tale. A lot of people may question why deep fry apples? Because they’re irresistible! That’s why! No seriously. Trust me on this. When you bite into the crunchy batter and taste the warm apple your taste buds will thank you. The version I present today is inspired by flavours found in the Middle East. I’ve been on a bit of a Middle eastern kick lately (remember my Middle Eastern style Pancakes?) and have thoroughly enjoyed cooking with these pronounced flavours. My apple fritters have orange blossom water in the batter. It’s gluten free as well because I ended up experimenting with tapioca flour with amazing results. There’s just enough of this perfumed nectar to give it a little aroma. I also topped the apple fritters with crushed pistachios and drizzled them with pomegranate molasses. Enjoy these with a nice “cuppa” and I’ll see you all soon. Scroll down for the apple fritters recipe. 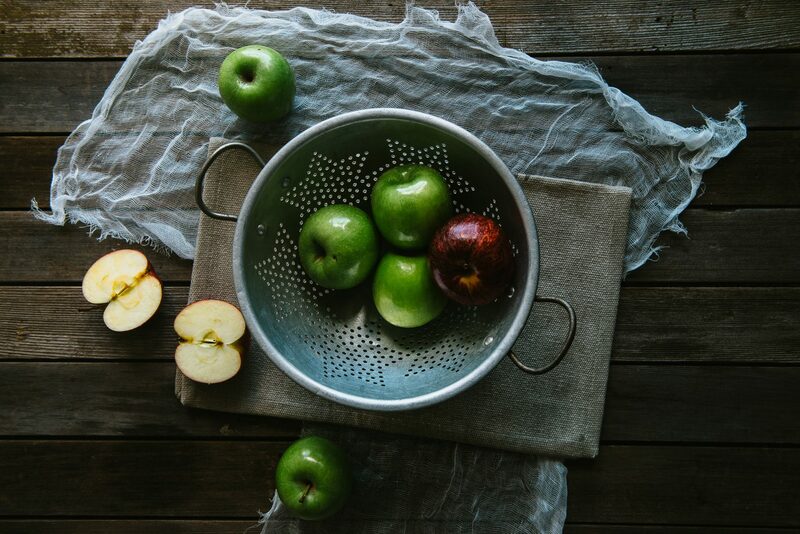 Combine the sliced apples and a good squeeze of lemon juice in a container and set aside. In another bowl mix together the tapioca flour, baking powder, milk, orange blossom water and egg until well combined. Finally add the melted butter and whisk through. Set aside. 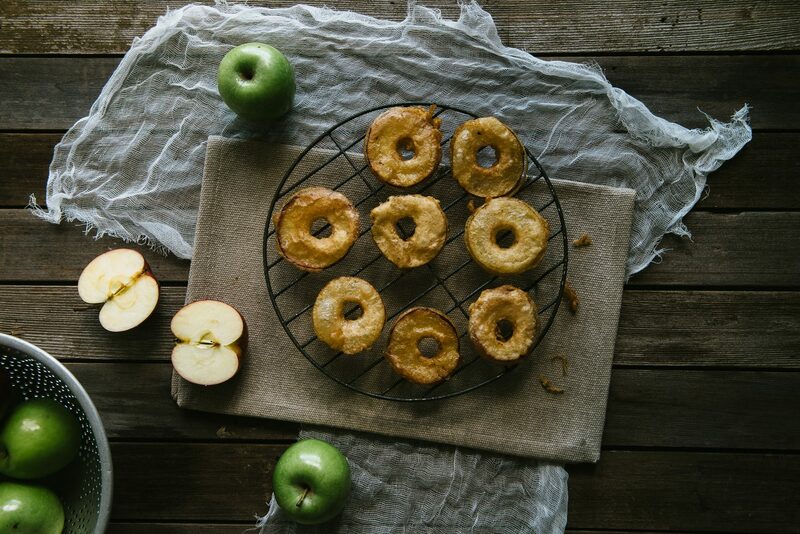 Once the oil is heated, very carefully dip an apple ring into the batter and cook in the hot oil for 2-3 mins each side until golden. Remove and place on a tray lined with kitchen towels. repeat until all rings are cooked. (I cooked a maximum of 3 at a time to stop the oil from cooling down too quickly). Serve the apple fritters with crushed pistachios and lightly drizzled with the pomegranate molasses.